Flowers To Sow In May. Seeds sown in May are generally much more successful than earlier sown ones…seeds sown in cold damp soils will often rot before they have a chance to germinate. For most of the UK they last frosts will be around mid May…this means that you can sow half hardy annuals direct into the soil and they need not quiver in fear of a cold spell. Warm soils will get your seeds feeling all saucy and ready to get on with the business of being a flower. Top Ten Flower Seeds To Sow In May. Here is my top ten…I have chosen these not only because they are drop dead gorgeous but also because they are all easily grown from seed and are suitable even for the most ungreen fingered of folk. 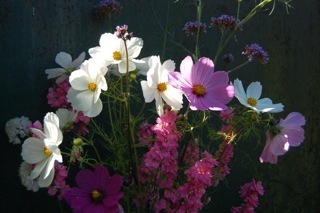 *Cosmos ‘Sensation’…any Cosmos are great to sow now. ‘Sensation’ is a great flouncy performer and will give you buckets of flowers…the more you cut…the more they come…’appy days. 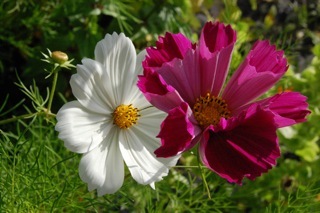 *Cosmos ‘Pied Piper’…another great flower to sow in May…gorgeous fluted petals…deep crimson on feathery foliage. *Cornflowers ‘Blue Ball’. Classic…another cut and come again…I would never dream of having a cut flower patch without cornflowers. *Calendula ‘Indian Prince’. 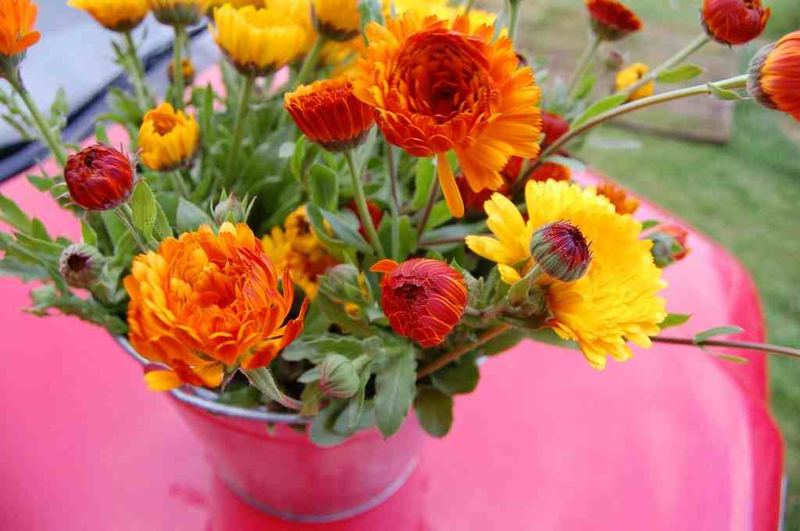 A particularly handsome calendula…flowers its socks off all summer…it will reseed for you the following year too. *Dill ‘Mammoth’. Dill is not just a kitchen garden plant…it makes a fab cut flower…adding architectural beauty to any arrangement. 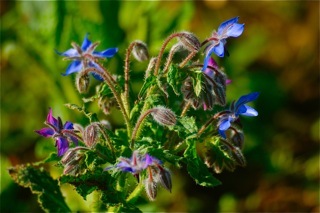 *Borage. The bees go potty for Borage and quite frankly so do I…this will add a cottage garden vibe to your patch and your vase…easy peasy to grow. They self seed like troopers…if you don’t want them to then cut them down before they set seed. Borage looks wonderful with Calendula. *Sunflower ‘Vanilla Ice’…this is a delicate branching sunflower…it has lashings of blooms and it’s edible to boot. *Corncockle…now very rare in the countryside…simple beauty…super easy to grow. Show them in a vase with Borage and Zinnia ‘Envy’ and your friends will tremble with jealousy. 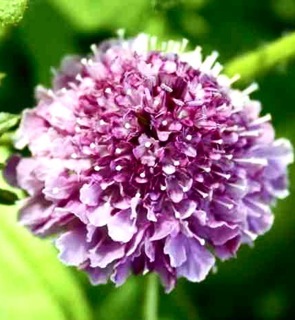 *Scabiosa crown…I prefer to start scabiosa in pots but it can be direct sown too…the bees love this one too. Very trad…a lovely lovely flower…can’t wait to have these blooming in the cut flower patch again this year. *Zinnia ‘Envy’…florists up and down the UK try to get their hands on this green Zinnia…very unusual….goes with just about everything…tres chic. Sow after the frosts and be careful not to over water…or she will get the hump. Have a wonderful May…let me know if you have any questions about your cut flower patch adventures. See also ‘Flowers To Sow In June’. Malope Trifida ‘Vulcan’ seeds germinating. 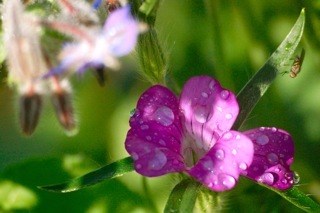 Growing Hesperis (Sweet Rocket) From Seed. Hi Benjamin, I’d love some of these, how do I get my hands on them?